When you live in the country you often have the opportunity to observe local wildlife. Sometimes, you have to do more than observe. Quite frequently, country dwellers find themselves rescuing animals from the possibility of death or injury. I have rescued a variety of animals over the years, including deer, skunks, raccoons, squirrels, rabbits, and the humble box turtle. Of this menagerie, turtles are definitely the least cuddly. However, they are one of Nature's most friendly and easy to raise animals. The box turtle can easily become part of the family. What is a Box Turtle? A box turtle is a variety of land terrapin. It is so named because of it's special hinged shell. This shell design allows the turtle to enclose himself completely at any sign of danger. 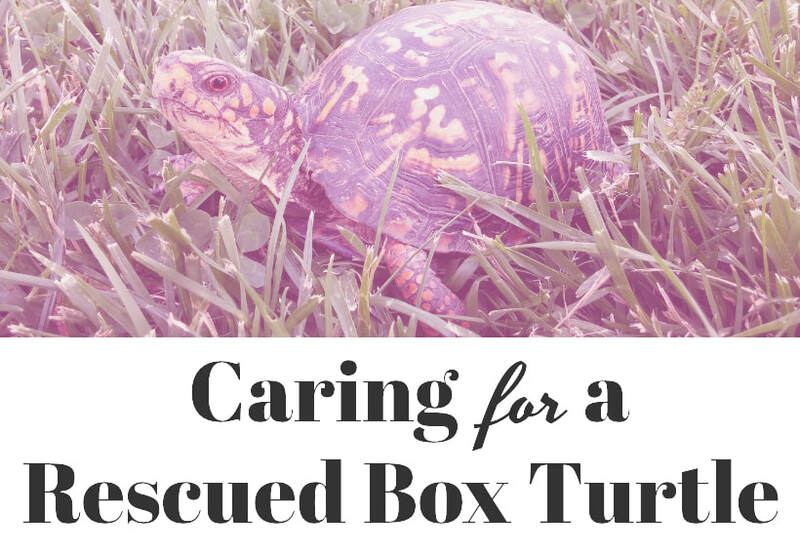 ​Should You Rescue a Box Turtle? I strongly discourage taking healthy box turtles from the wild on a whim. Females especially need to remain in their natural habitat so that they can lay their eggs according to their cycles. All North American box turtles are considered to be either vulnerable or threatened due to human activity and climate changes. 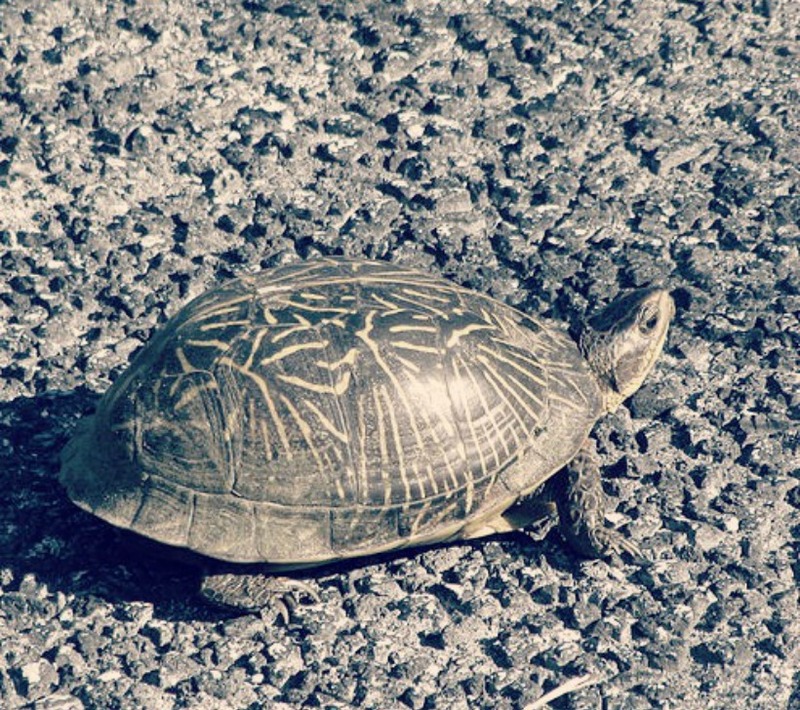 Even if you are saving a turtle from certain death on a busy highway, you should relocate him or her to another a safer area, such as by a stream or in the woods. However, from experience, I know that box turtles can be kept for a few weeks if you would like to observe them before releasing them, or if it will be awhile before you can relocate them to a safe area. As long as the turtle is well cared for, a short period of captivity won't harm him. Injured turtles should be rescued if possible. 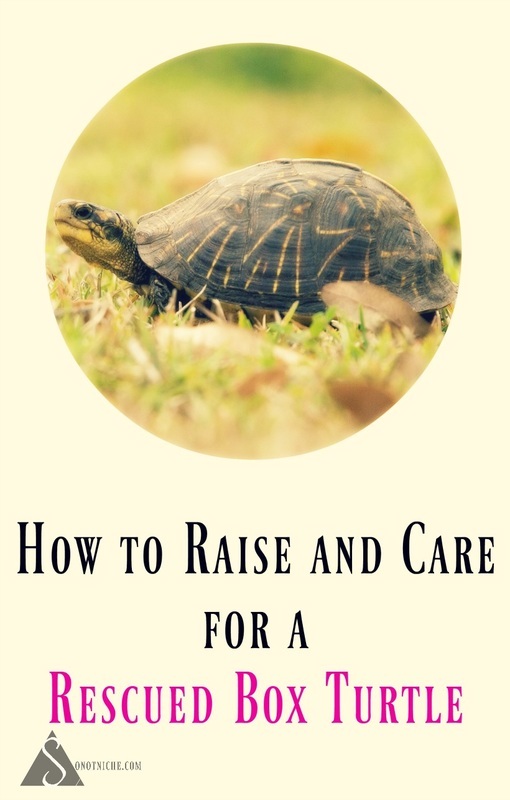 If you are fortunate enough to have a vet in your area that specializes in exotics, or a local wildlife rescue facility, then you can take your turtle to them for proper care. Although we've come a long way with conservation, there are still areas that don't have access to rescue facilities or care. When I rescued one of my young turtles he had multiple shell fractures. The nearest vet that would even consider 'wasting time' on a wild turtle was located over 250 miles away, which was simply not possible. I used common sense and first aid tape to repair the shell instead, and gave plenty of calcium. His shell did mend, but he was not able to fully retract anymore due to a piece that was chipped away. . This would have endangered him in the wild, so he became my ward. If you simply desire a turtle as a pet, there are farms that specialize in raising box turtles for sale. Be sure to check that it is a reputable business. Turtles that are rounded up from the wild for the sake of sale are often mishandled and malnourished. Since the farms breed the turtles, you won't be taking any turtle from the wild that needs to be continuing the species. The hardest part about rescuing a turtle is providing an adequate house for him. They require spacious accommodations that allow access to either the sun or an artificial light for at least 12 hours a day. Some people recommend allowing turtles to have the run of the yard. This seems like the kindest thing to do, but it can be dangerous for the turtle, especially an injured turtle that might not be able to fully retract. Box turtles can burrow and climb, therefore a fence would need to be made of tightly woven wire and set at least two feet underground, with very little space between gates and posts. Dogs, humans, machines, and chemicals can harm turtles. ​Unless your yard is fenced like a fortress and completely chemical, pet, and traffic free it is safer for your turtle if you provide him with his own enclosure. This can be either indoors or outdoors, depending on the space you have available. For an outdoor turtle, a pen can be built that is roughly 3'x4'. Since turtles will climb if they can gain any purchase, the sides need to be at least six inches tall AFTER the pen is filled with substrate or bedding. At least 1/3 of the pen needs to be shaded at all times or the turtle can become dehydrated and die. You will also need to provide a shallow pool or water dish that the turtle can soak in. Box turtles can swim, but they tire easily and can drown if the pool isn't easy to exit. ​A shallow lid or dish, or something with sloped sides is best. Since turtles defecate in their water, you will want the water pool to be made of something that is easy to remove and clean. For bedding, in either an outdoor or indoor turtle container, you can use soil collected from the turtle's own habitat. A combination of leaf mulch, potting soil (chemical free), and sand will also work. Outdoor turtles can be given grass clippings as well. Provide a box or other shelter for the turtle to hide in during the sleepy daytime hours. An indoor box turtle can be kept in an aquarium or a large plastic storage container. They tend to prefer the opaque sides of a plastic container rather than glass. The container should be large enough that the turtle can ambulate freely. It will also need a shelter or "cave", a water dish, and a feeding dish. An indoor container should be scooped frequently and exposed to (preferably natural) light at least 12 hours a day. Spray the substrate each day to keep it moist even when there is an adequate water supply. Even with a roomy container, it is recommended to let the your the box turtle roam the free for awhile each day. To do this safely, close off a room where children and pets can't hurt the turtle, and no one can step on him. Make sure there are no "hidey-holes" where they can get lost. For both indoor and outdoor enclosures, artificial heat needs to be provided if the temperatures fall below 60 degrees Fahrenheit. There are a number of heat sources available in pet stores for reptiles, such as ceramic heaters and heated tape. If you have the space, materials and inclination, consider both an indoor and outdoor enclosure. This way indoor turtles can be taken outside to enjoy the sunlight and the thrill of hunting their own prey. Although box turtle feeding is touted as being complex, if you observe a turtle in nature, you will see that they have a varied, yet simple diet. They like vegetables, berries, weeds, flowers, fruit, insects, mollusks and earthworms. Turtles will devastate gardens by eating holes in tomatoes, watermelons and cucumbers. You can provide a complex, balanced, gourmet diet, but your turtle will do just as well eating what he ate in nature. Turtles are rather like toddlers. They will have a favorite food, and will stubbornly refuse to eat anything else if you don't mix it up a little. IF you have discovered that your turtle loves a certain food, save it for an occasional treat if he or she is refusing to eat other foods. They will also eat bread, cornbread, potatoes, kibble, and anything that catches their eye. Since turtles require a lot of calcium you can offer a cuttlebone or sprinkle calcium supplement over their food. Turtles are attracted by movement and color, so if a turtle is being particularly finicky you can try wriggling a tomato or strawberry with a thin rod or wire. You may notice that your usually docile pet becomes a ruthless killer when he spies an earthworm or other wriggling creature. Some turtles will snap at fingers if they are fed living worms/slugs often, so take care. Sometimes simply dropping the items within the turtle's line of vision will entice them. If this doesn't work try spraying them with a fine mist of water. Land terrapins are more active on rainy days, so a mist of water will sometimes stimulate the appetite. Soaking the food slightly can also interest a finicky eater. Indoor turtles may require a reptile vitamin supplement two or three times per week if they are not exposed to sunlight. Box turtles will have individual tastes much like humans. For instance, they are supposed to love bananas, but I could never get any of my turtles to eat a banana! Some loved fish, others preferred bugs. Keep trying a variety of balanced foods. Adult turtles may only eat every day or so. Juvenile turtles often eat voraciously every day. Just remember to wash your hands before and after you handle a turtle, for your safety and his. Open wounds and a broken shell can make a turtle susceptible to infections. Also, never let children or dogs rough-house a turtle. He needs to be handled calmly and in way that ensures he will not be dropped. Enjoy your new pet. With proper care and feeding, a box turtle can live over 50 years in captivity! Usually, box turtles just need a little help getting off the road as quickly as possible. -photo source wikimedia commons. I repeat! Land terrapins can swim. However they are not "water turtles". Do NOT release a box turtle by throwing him into a large body of water. He can tire before he reaches the shore. Don't release box turtles on roadways. Not even dirt roads. It may take several minutes before they venture out of their shell and begin to walk, and that is enough time for an oncoming vehicle to hit them. Find a nice, remote area where you can walk the turtle into the woods. Face them away from the road. If they come out of their shell and see an open safe area, they will usually take off on their own. NOTE: Not all turtles who wander need to be rescued. Many simply need to be set off of roads and pointed towards the safety of the woods or grass. Box turtles can become stressed if they are moved too far from their birth area, so please keep that in mind when relocating them or deciding whether or not they need to be rescued.